Despite advances in seabed mining technology, scientific knowledge concerning the unique biophysical character of the deep sea environment remains sparse. This means there is relatively little information concerning the potential risk of environmental damage associated with proposed seabed mining activities. The exploration and development of natural resources outside sovereign territory is governed under the 1982 United Nations Convention on the Law of the Sea (UNCLOS). Mining the seabed located under the high sea, more commonly known as the Area, is controlled under Part XI of the UNCLOS. Likewise, the right of states to undertake mining within their Exclusive Economic Zone (EEZ) and continental shelf is also established under UNCLOS. These rights to develop natural resources located within the seabed are attended by the corresponding obligations to protect and preserve the marine environment. States and state-sponsored companies proposing to engage in exploration or exploitation of resources in the Area must obtain approval from the International Seabed Authority (ISA). The Republic of Nauru and the Kingdom of Tonga applied to the ISA to explore the Clarion-Clipperton Zone in April 2008. Located in the Pacific Ocean, to the south and south-east of the Hawaiian Islands, this part of the Area is considered to hold the most promise in terms of commercially viable manganese nodule recovery. Nauru and Tonga subsequently became concerned about their potential liability for damage to the marine environment resulting from seabed mining and postponed their applications. Nauru then requested the ISA obtain an advisory opinion on state parties’ obligations and liability for seabed mining from the Seabed Disputes Chamber of the International Tribunal for the Law of the Sea (the Chamber). These obligations would feature strongly in future regulatory efforts within the Pacific region designed to address the lack of information and uncertainty in relation to the impacts of mining on the marine environment. The Chamber went on to find that state parties would be liable for damage arising from the failure of a state to carry out its obligations. On the other hand, adoption of the precautionary approach, best environmental practices and EIA within a state’s legislative framework would reduce the risk of liability in cases where environmental damage did occur as the result of seabed mining activities. New Zealand Exclusive Economic Zone and Continental Shelf (Environmental Effects) Act 2012 (EEZ Act). These initiatives can be said to have firmly established the key obligations within the Pacific as central to regulating seabed mining activities. 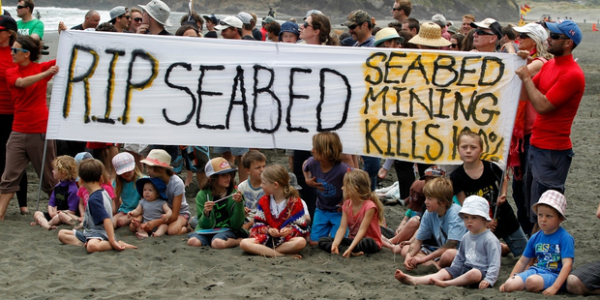 Moreover, the recent decisions of the Environmental Protection Authority (EPA) in Trans-Tasman Resources and Chatham Rock Phosphate  concerning applications for seabed mining under New Zealand’s EEZ Act, have demonstrated that consideration of the precautionary approach, best environmental practices and EIA require an adequate understanding of the existing marine environment before development can proceed. In declining both applications, the EPA has made clear that lack of information and uncertainty does not require regulators to prevent exploration and development from taking place. However, the precautionary approach does require the collection of adequate baseline data on existing environments before commencing exploration or development. This is to ensure that any potential environmental changes arising out of lack of information or uncertainty as to the impacts of seabed mining are able to be monitored and controlled to avoid significant adverse effects. The key obligations identified in the Advisory Opinion have been adopted in the Pacific region as regulatory prerequisites to deep sea exploration and development. The decisions made in New Zealand have, in turn, signalled that baseline data is required to proceed where there is imperfect information. It might be said that the obligations identified by the Chamber are serving the regulatory function for which they were intended. Robert Makgill is an Auckland barrister who specialises in environmental and natural resources law. He appeared as legal counsel for parties in the Chamber’s Advisory proceedings and Trans-Tasman Resources. He regularly advises on seabed mining regulation throughout the Pacific region. See http://www.robertmakgill.com. Ana Linhares is a doctoral researcher who specialises in natural resources, international environmental law and law of the sea. 1. See forthcoming publication – Makgill, R. and Linhares, AP., ‘Chapter 15: Deep Seabed Mining – Key Obligations in the Emerging Regulation of Exploration and Development in the Pacific’, in Warner, R. and Kaye, S. (eds.) Routledge Handbook of Maritime Regulation and Enforcement. 2. Seabed Disputes Chamber of the International Tribunal for the Law of the Sea Responsibilities and Obligations of States Sponsoring Persons and Entities with Respect to Activities in the Area (Advisory Opinion) (1 February 2011) (“Advisory Opinion”), at para 110. 3. Anton, D., Makgill, R. and Payne, C., ‘Advisory Opinion on Responsibility and Liability for International Seabed Mining (ITLOS Case No. 17): International Environmental Law in the Seabed Disputes Chamber’, (2011) 41/2 Environmental Policy and Law 60 to 65, at 63. 4. Secretariat of the Pacific Community (SOPAC Division), Pacific-ACP States Regional Legislative and Regulatory Framework for Deep Sea Minerals Exploration and Exploitation prepared under the SPC-EU EDF10 Deep Sea Minerals Project, (1st ed. July 2012). 5. Trans-Tasman Resources Ltd Marine Consent Decision, Environmental Protection Authority, dated 17 June 2014; and Decision on Marine Consent Application by Chatham Rock Phosphate Limited, Application Ref: EEZ000006, Environmental Protection Authority, 10 February 2015.